I buy buttercup because it is available in small sizes. I can use one pumpkin once or twice and I am done. No more saving in refrigerator. Buttercup is button-less pumpkin variety. It has a deep orange fiber-less flesh. It is medium-dry with a rich sweet flavor. Buttercups become sweeter after a few weeks, so don’t be afraid to store this one. 1 small Buttercup squash. Enough to get 2 cups of mashed squash. I used ½ of squash in picture above. ⅛th tsp - Fresh ground cardamom. Skin discarded. Cook buttercup squash in pressure cooker for 3 whistles. If cooking in a pan, fill pan with water. Place squash half in wanter. Close lid. Boil till squash is soft. Cool down squash. At this point, squash skin will easily come off with fingers. Remove skin and discard. Squash is so soft you don't need to mash. Stirring in next step will mash it. If you want, you can mash with masher. In a separate pan, pour ghee. Heat to medium. Add mashed pumpkin. Stir every 1 minute. 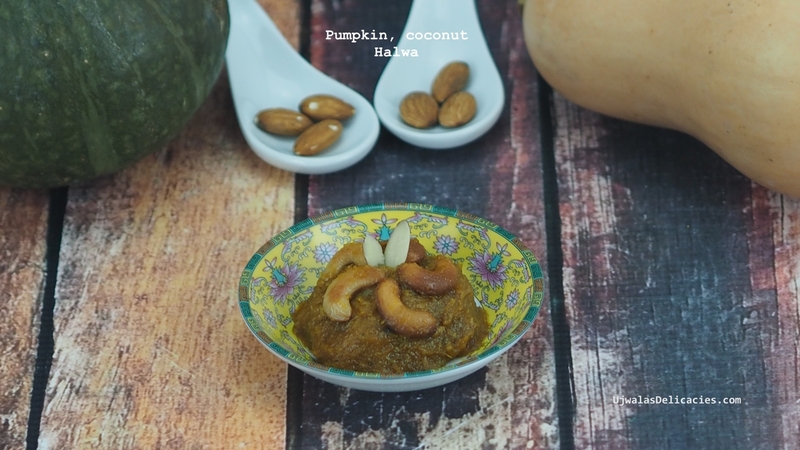 After 5 minutes, add jaggery or dark brown sugar, coconut and cardamom. Jaggery melts and makes dish watery. Keep stirring every 30 seconds to 1 minute till water evaporates and halwa consistency is harder than batter. In another pan heat ⅛th tsp ghee. Fry nuts till golden brown. 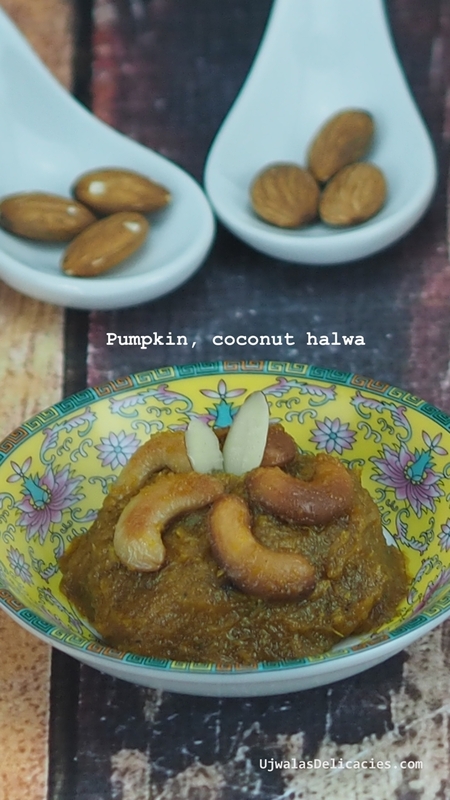 Pour fried nuts over halwa.